In the south of France, a former special-ops mercenary "Frank Martin" (Ed Skrein) enters into a contract with a woman and her three partners in crime who are out for revenge against a sinister Russian kingpin and his cronies. Being perfectly watchable with the class of a very well constructed James Bond-esque knock-off, we have to be careful not to expect too much. But Camille Delamarre’s The Transporter Refueled is one of the most honest action films I've ever seen. At no time does it ever purport to be anything it's not. It makes no bones about being a sly, action-obsessed, smash-a-thon with little else to offer than revved engines, pretty femme fatales, and more arm-bars and wrist-lock manipulations than are found in two standard action flicks. Jason Statham wasn't interested in refueling his tank with the new Transporter movie, so the opportunity went to Ed Skrein, a guy who will give Statham a run for his money any day of the week and twice on Sundays--both in terms of his moves, his grainy voice, and his visual rightness for the part. His character's jadedly nonchalant attitude is itself an expression of just how much he enjoys landing every single punch on an opponent. He is nicely presented in fashionable, expensive suits, as he sports as much meticulous attention to detail as Statham's Martin ever had. Martin, like Statham's Martin, makes his living running black-bag cargo in and out of various places for shady people. And it, in some way, drives him to do it more, despite the dangers involved. 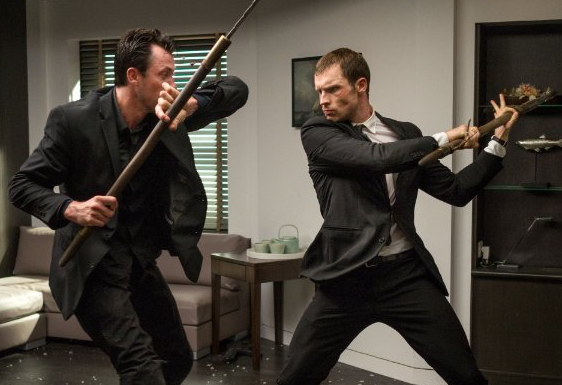 Skrein might actually have Statham beat (I, for one, would love to see them duke it out). Martin's job in this film involves an over-the-top ruthless Russian crime boss "Arkady Karasov" (Radivoje Bukvic) on the French Riviera. His ladies for hire are at the center of a brutal payback plot involving deception, cleverness, and enough of a passable story to keep us watching. Whether we're talking martial meleas or hacking bank accounts through intricate-but-improbable plots pulled off by beautiful women in blonde wigs, it's worth a watch if you've got an hour-and-a-half to kill. But despite all of the looks and style of Skrein, almost half of his thunder is stolen by his retired father (Ray Stevenson) who himself is still sporting enough charm and deadliness to give his boy a serious run. In battles of charm, wit, and fist-a-cuffs, there is something to be said for a lowbrow movie that gives you what it promises before backing away to be forgotten about. It's not a high bar to obtain, but this Transporter easily beats the previous movies in terms of quality.